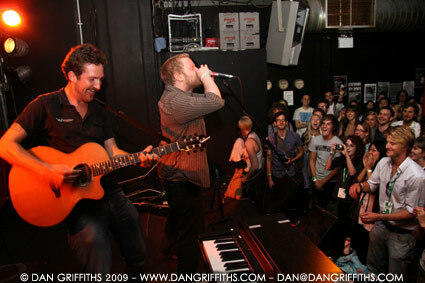 This photo (taken last Thursday) shows Frank Turner performing at 93 Feet East, London as part of the Brick Lane Takeover. Frank was looking for a member of the crowd to play a harmonica solo. After he failed to persuade Kingston singer/songwriter Dave House he asked my friend Ben who did a pretty damn good job! Click on the image to view it large on Black. I did a photo shoot with The Xcerts before the show and I’ll be putting these in the gallery soon.